At least 49 people are dead and dozens more have been seriously wounded during multiple terror attacks today in Christchurch, New Zealand. The attacker used several long guns to target Muslims at two mosques and had what police described as explosive devices. One series of attacks was livestreamed on Facebook for 17 minutes. Three men and one woman have been arrested, according to the New Zealand Herald. One of the terrorists has been identified as a 28-year-old originally from Grafton, Australia who released a manifesto filled with white supremacist hate, references to internet culture, and praise for President Donald Trump as a “symbol of renewed white identity.” Facebook has deleted the terrorist’s Instagram and Facebook pages. “Our hearts go out to the victims, their families and the community affected by this horrendous act,” a Facebook executive for Australia and New Zealand, Mia Garlick, told the Guardian. TV news stations in Australia broadcast portions of the shooter’s video, but cut out shortly before the terrorist entered one of the mosques. Police in New Zealand had asked that the video not be shared. The terrorist manifesto appears to be an attempt to troll the media and was posted to sites like Scribd before being taken down. One of the attackers can be heard saying “remember lads, subscribe to PewDiePie” in the video shortly before one of the shootings, a reference to a popular YouTube personality who has previously received criticism for helping to spread white supremacist rhetoric. PewDiePie, whose real name is Felix Kjellberg, tweeted his condolences saying that he was “absolutely sickened” by the attacks. 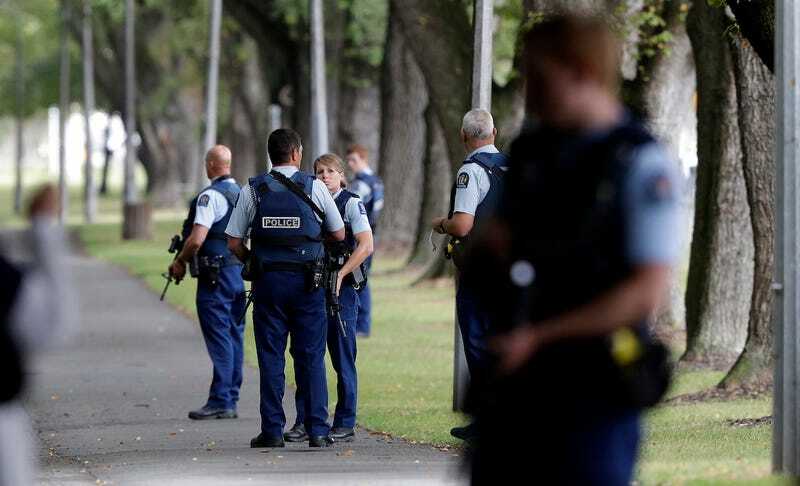 At least 41 people were killed at the Deans Avenue mosque and another seven died at the Linwood Avenue mosque in Christchurch, according to New Zealand Prime Minister Jacinda Ardern, who gave a press conference a few hours after the shootings began. Another twenty people were described as having “serious” injuries. Every social media company is playing whack-a-mole right now with content that was created by the attackers. As the original video and manifesto get taken down on sites like Facebook and Scribd, they’re posted again to places like YouTube and Twitter. One of the attacker’s Facebook pages was filled with links to white supremacist content, including a number of anti-immigrant videos on YouTube. The video-sharing site is owned by Google and has been a hub of extremism over the past few years, radicalizing young white men through a narrative that western countries are being “invaded” by foreigners, and specifically Muslims. The title of the manifesto, “The Great Replacement,” a reference to white people being “replaced” by Muslims and other minorities in western countries, has been echoed repeatedly in mainstream news both in the U.S. and in Australia, where one of the attackers is from. Code words like “replace” are used by mainstream hate-peddlers like Tucker Carlson on Fox News, and the phrase “Jews will not replace us” was chanted at the infamous neo-Nazi rally in Charlottesville in 2017. “Our hearts are broken over today’s terrible tragedy in New Zealand. Please know we are working vigilantly to remove any violent footage,” YouTube tweeted. A Reddit forum called WatchPeopleDie was repeatedly posting the video, before New Zealand Police requested that the video be taken down. Users on that forum cried “censorship” and were upset that their links were getting pulled. Gizmodo was able to find multiple re-uploads of the full 17-minute video on YouTube hours after the attack. The video shows one of the shootings from the gunman’s perspective, recorded with a head-mounted camera in the style of a first-person shooter video game. What sounds like polka music in a foreign language can be heard through the car’s speakers as the shooter drives around. Another song played in the car during the shootings has been described as “17th-century British military music” by the Sydney Morning Herald. The shooter appears to be talking with at least one other person in the back seat of the car. The horrific video shows the shooter killing men, women and children. Some people are crawling on the floor after first getting shot, and at least one man in a mosque is seen trying to fight back against the attacker by rushing him, but he’s killed as well. Some victims had huddled in a corner where the shooter repeatedly shoots into a mass of people. “There wasn’t even time to aim, there were so many targets,” you can hear the terrorist say to his accomplice in the back seat as they’re driving around. President Trump’s only tweet so far about the incident has been a plug for Breitbart News without any kind of commentary denouncing the terrorist attacks. Far right politicians in Australia placed the blame on Muslims rather than the white Australian terrorist who carried out the shooting. “The real cause of bloodshed on New Zealand streets today is the immigration program that allowed Muslim fanatics to migrate to New Zealand in the first place,” Australian senator Fraser Anning tweeted after the attacks. “Does anyone still dispute the link between Muslim immigration and violence?” Anning said in another hateful tweet. The Prime Minister of New Zealand sought to comfort a grieving nation and described the attacks as the worst in the country’s history. This is a developing story and will be updated as more information becomes public.